Animation editor operators is a powerful plugin system built into the animation editor. 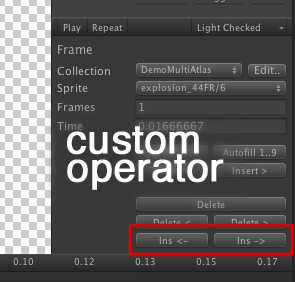 It can be used to extend the animation editor without having to change the source code to the editor - the only requirement is that your animation editor class inherits from the base operator class (tk2dEditor.SpriteAnimationEditor.AnimOperator), and that it exists within an Editor folder. You can use animation operators to streamline workflow specifically for your project, without having to hack into 2D Toolkit code. A large number of the built in operators are implemented using the same system. Refer to tk2dSpriteAnimationAnimOp.cs for the complete list. A sample operator - This is exactly the same as the built in Insert operator, but will add itself after all the built in operators. This file should be dropped into an editor folder for it to work. // It isn't essential though. // SortID defines the order in which the operators are processed, and drawn in the inspector. // Negative numbers are reserved for the editor and may change without warning. // Check the AnimOperator class for the different supported operator types. // This sample simply deletes the frames after the currently selected clip. // WrapMode.Single is a special case - you are only allowed to have one frame in a "Single" clip. // If you don't handle this, tk2d will truncate the list when it is Committed. // Keep track of changes. // tell the system that something has changed. // Make sure state is valid after performing your operation. // For instance, if the selected frame is deleted, ensure it isn't selected any more.